Earlier this week a Longmeadow DPW employee tragically lost his life at the Birnie Road rail crossing when the snow plow he was operating was hit by an Amtrak train that was clearing snow from the rail line. This accident has been extensively covered by the media and is under investigation by local, state and federal authorities so this posting will not delve into the details of the accident. Instead, this posting will at look at the topic of highway-rail grade crossing safety in general in our region, with a focus on the crossing at Birnie Rd in Longmeadow. There are a total of 119 public highway-rail crossings in the three counties that make up the Pioneer Valley. Each crossing is marked with passive signage. Most crossings are also protected by active warning devices such as bells, red flashing lights, and gates. The Federal Railroad Administration (FRA) has for many years maintained a detailed inventory of all highway-rail crossings. From the FRA’s Office of Safety Accident/Prediction web site we were able to generate a report (shown below) of all highway-rail crossing in our region. In summary, the report shows that for the five-year period (January 1, 2011, – December 31, 2015) there were a total of five (5) reported accidents at highway-rail crossing in the Pioneer Valley — which thankfully is a very low number. Three of the accidents occurring at a single location — the grade crossing that takes Bridge Street in West Springfield over the CSX rail line. For reasons that we cannot explain, the Birnie Road crossing does not appear on the FRA’s list of active highway-rail crossings. 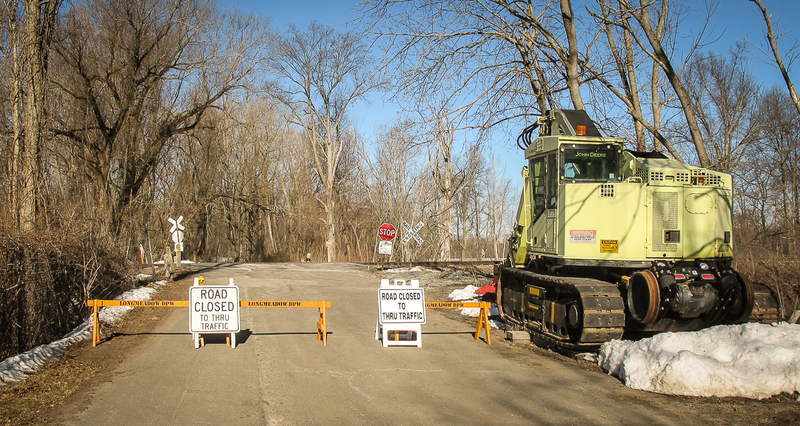 Updated 3/28/2017: The Birnie Road crossing reverted to “open” status when Amtrak submitted a revised DOT Crossing Inventory form to the FRA on March 24, 2017. This is an aerial view of the crossing courtesy of Google Maps. And this is a Google Street View image of the crossing. Birnie Road in Longmeadow crosses the Amtrak Springfield Line. Our understanding is that passenger trains are authorized to operate on the two tracks at this location at speeds up to 70 80 m.p.h. The Amtrak Springfield Line is used by Amtrak trains that operate between Springfield and New Haven. The line is also used by a number of freight trains each day. In early 2018 this line will see additional rail traffic when the Hartford Line service launches, with the addition of 12 daily round-trip Hartford Line trains between New Haven and Springfield. MassLive reported this week that there have been a total of five (5) fatalities at the Birnie Road crossing since 1975. On Thursday, March 16th WWLP News22 reported that the Town of Longmeadow had set up barriers across the road at the Birnie Road crossing. Once the investigation is complete, the proper authorities — which we understand are the Town of Longmeadow, Amtrak, and the Department of Public Utilities — must decide what steps need to be taken to reduce the risk of future accidents at this dangerous rail crossing. In our view, there are only two options — either upgrade the crossing at Birnie Road with active warning devices or close it permanently.